*~* This is A Vogue Vintage Ginny Doll and House Carrying Case. 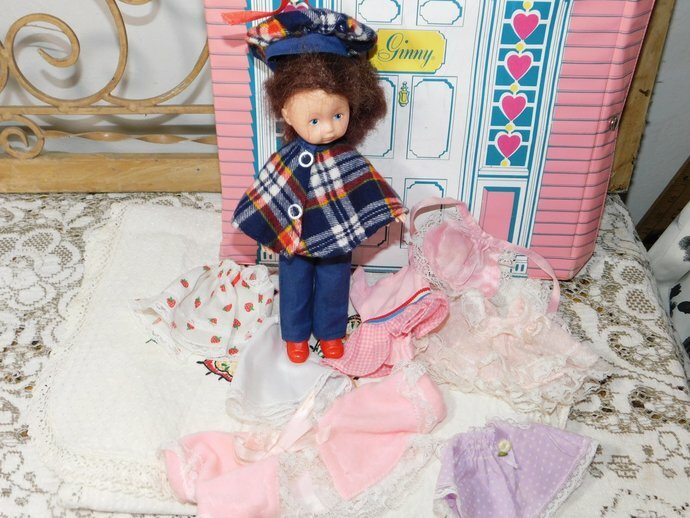 This Doll and Case has been played with..This Vogue Vintage Ginny Doll, She comes with all the clothing in the picture.. The case has some splitting on the outside of the case and some inside the case as well .It is split in front of case at top and bottom of front panel in back spine.. It has the name Jill written in the front of it and on back part. It has some splitting on door of dresser inside it. The Case Measures about 13 inches tall, 10 inches across and 3 1/2 inches wide.. The Handle is on top. 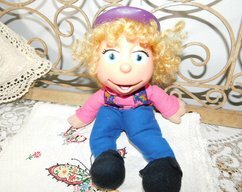 Doll is sweet as can be and has this darling wearing her plaid cape, matching hat and blue pants. On her feet is bright red shoes. This Vogue Vintage Ginny Doll She has her hair in a pony tail and does have some hair breakage under ponytail.. 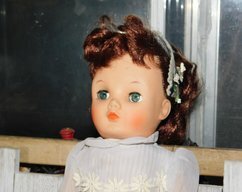 This Vogue Vintage Ginny Doll She measures about 8 inches tall. She is from a smoke free home.. 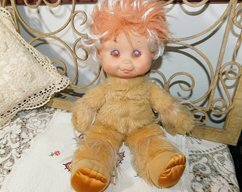 This Vogue Vintage Ginny Doll She is sold As is played with condition. BRING BACK THOSE SWEET CHILDHOOD MEMORIES ONCE AGAIN. ALSO POSTING ANOTHER ONE.